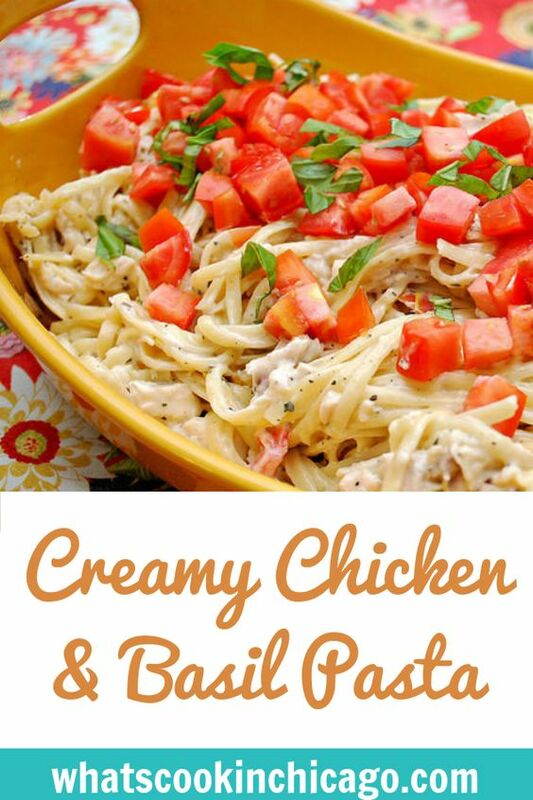 This pasta dish combines chicken, basil, and tomato in a creamy parmesan cheese sauce with perfectly cooked linguine pasta. The dish can be made all on the stovetop in less than 30 minutes with minimal ingredients! Leftovers are great too and the fresh flavors of basil and tomato really shine through. 2. Meanwhile, heat oil in large saucepan over medium heat. Add flour; whisk to combine (mixture will be clumpy). Slowly whisk in milk and broth, stirring until smooth. Whisk in cheese. Season with salt and pepper, as desired. Add chicken and basil; cook 5 minutes or until heated through, stirring occasionally. 3. Add chicken mixture to pasta; toss to combine. Serve topped with tomato and fresh basil. Nutrition information (1/6 of recipe): 390 calories; 25 g protein; 50 g carbohydrates; 11 g total fat; 3 g saturated fat; 40 mg cholesterol; 290 mg sodium; 6 g total dietary fiber. This looks great, so nice a fresh. Dreamfields sure does make some great pasta! Love Dreamfield pasta. This recipe sounds delicious and easy to make. Pretty pictures. This looks like a fun and appetizing dish to make. Thanks for the giveaway, this recipe looks delicious! This looks so good! And quick and easy, too. Great for a weeknight! Posted this on Facebook a couple days ago to make later & today is the day! Going to cut the recipe in half and make it tonight. Thanks! And thanks for the opportunity to win, too! Dreamfield pasta is the only kind we use - love it. 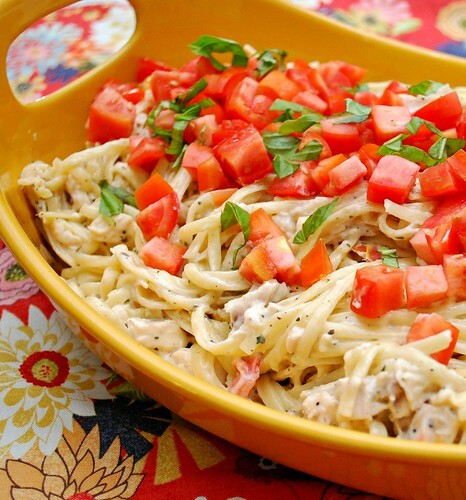 I love chicken pasta, this makes me hungry! 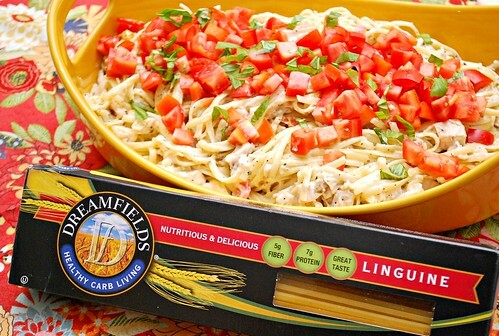 I love Dreamfields pasta and this will be another great recipe to try. Most of the ingredients I already have. Simple and good . The Tomato and Olive Rotini recipe on their site looks amazing! I am going to make this for dinner tonight. Sounds really good. Love all the ingredients, especially the fresh basil. How we love pasta..especially creamy pasta dishes like yours. This recipe would be awesome with shrimp or crab as well. We love pasta and all the noodle options depending on my I am making. I use elbows and linquini the most..for seafood dishes and Mac and cheese. This is a great giveaway..thanks.my second attempt to enter..I hope it goes through. floridagld at yahoo dot com. Yummy! This looks like something my whole family will love. Your photos are beautiful and drool worthy. Thanks for posting! I think this looks yummy. It's finally starting to cool off enough that I want warm creamy pasta for dinner. Oh that looks so good! We love chicken pasta dishes in my family! I love how it uses the chicken broth! Oh I cannot wait to try it! My family loves pasta. Your recipe looks really good! I love angel hair pasta. Thank you! I'd like to try Dreamfields in my moms pasta salad recipe.